Another kids entry level tumbler, this time from Elenco. This is a space age looking gadget the kids will love, it is quite large in terms of its base footprint size – but also the barrel is a bit bigger than other entry level machines. 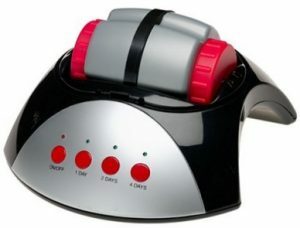 It is mains powered and has the universally unique feature of buttons on the front which allow the owner to pre-set timed tumbles in sets of upto 7 days. 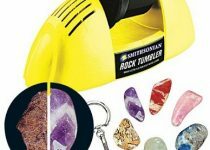 This is actually really handy because quite often it’s easy to forget how long a batch of rocks has been running for – and this is important when softer rocks are being worked. The lid on the machine is completely detachable allowing you to place the barrel into position, it acts as a bit of a sound barrier and is effective to some extent, but as always – the tumbling process is somewhat noisy. It looks good – so the kids will love it. It does the business and has a slightly larger barrel than most kids tumblers. The barrel has raised parts inside it – this greatly increases the performance as flats cannot form easily becaus the rocks are continuously “flipped” over into different positions as the strike against the ridges. Handy (and we believe unique) timer facility allowing the user to put a limit on the time the barrel is running. Quite heavy due to its size – this is good for stability. 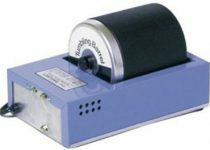 The motor will not work untill the cover is securely in place – this prevents small fingers getting into the cogs on the inside whilst it is turning. Comes with more than enough media such as polish and grit to grind down your first batch. A good set of rocks which we suspect is fairly random, but included Green Aventurine, Citrine and Tiger Eye (plus others). 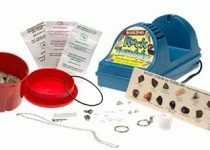 Includes the jewelry starter pack – which isn’t obvious on the sales material. Really solid thick walled barrel with excellent seals and the ability to tighten the lid down hard. The barrel is turned using a cog which “grips” a rubber ring on the outside of the barrel. Ours was very prone to slippage and it is essential that this whole of the outer barrel is 100% dry before setting up. The cover is a bit fiddly to put into place, but not a big deal really – the switch is depressed by a prong on the lid cover itself, we had to press down quite hard to get this into the slot and connect with the switch. Again, only one barrel – MUST BE KEPT SPOTLESS! The shape of this barrel, whilst its a good size and extremely robust, means that grit can accumulate around the lid parts. Not something to deter a buyer, but bear in mind that cleaning is a little more difficult as you have to get something like your finger bent round beneath the lid – whereas on straight moulded types its just a case of a wipe around the top. See the image on the left to look at what we mean.